Ceramic SMD package, Stratum III, CMOS and Clipped Sine Wave Output Optional. HC-35/U (T05), HC-43/U, Fast Warm-up. SC-Cut Crystal, High Stability, Low Phase Noise and Fast warm-up. Isotemp Research Inc. is producing high quality frequency control products for the communication and test equipment industry. 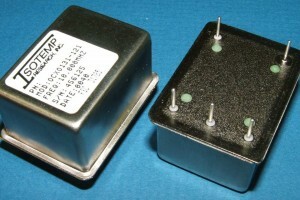 The company was founded in 1968 and has provided continuous growth and product improvement through value engineer and surface mount production techniques. The current product lines include Oven Controlled Crystal Oscillators (OCXO’s), Temperature Compensated Crystal Oscillators (TCXO’s), and miniature heater for quartz resonators. Crystal oscillator products are usually designed to meet specific individual requirements for size, output frequency, input voltage, output power, stability, and many other parameters.